It stuck in my brain and woke me up at 4:30 in the morning. Because I’ve been thinking the same thing. Yesterday I drew this chart on our whiteboard in the USV conference room for Bijan and Albert. 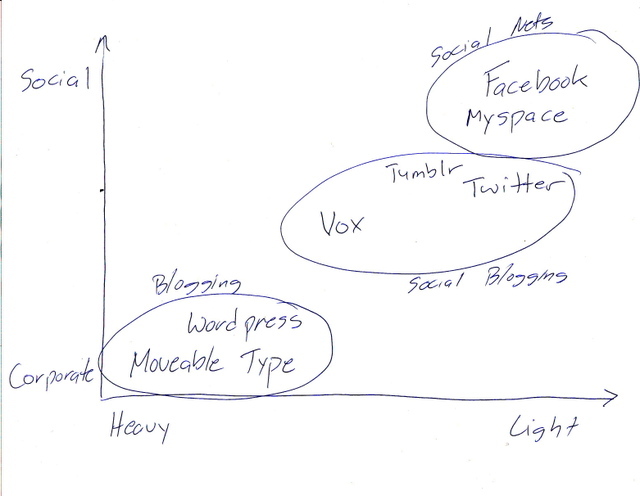 Blogging and Social Networking are different. Blogging is a new form of publishing and increasingly it means serious publishing. If you look at the top blogs on techmeme, most are not personal blogs, they are for profit money making entities. 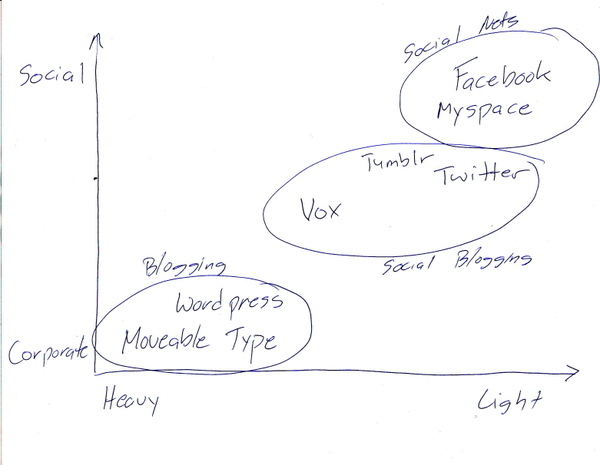 Social networking, as defined by Facebook and myspace, is largely person to person communications without much blogging going on. Both services offer blogging capabilities but they are not used that often as far as I can tell. Leaving comments, writing on a wall, poking, posting and tagging photos, and that kind of person to person communications is the staple of the big social nets. There’s an emerging category in the middle that takes from both blogging and social networking and we at Union Square Ventures are heavily invested in it with our investments in Twitter and Tumblr. I’ll call it social blogging but I’d sure love a better name for it. Some call it microblogging. Tumblr users call it tumblogging. I am not sure either name is ideal. If you have a better name idea, please leave it in the comments. Click on that when you see a post you like and slowly but surely you can create a tumblog of your very own without ever posting anything directly to tumblr. That’s why Ricky called it a "sharing community". Of course, over time, I bet you’ll start wanting to post stuff there. It’s just so easy and so fun. Twitter and Vox are similarly social. Twitter’s a bit different because the posts are kept to 140 characters or less and it’s not a visual experience like Tumblr. I use Twitter to share stuff I am doing with everyone and Tumblr to share stuff I am seeing and hearing with everyone. I pull all my twitters into tumblr and I’ve seen a few of them get reblogged which is pretty cool. 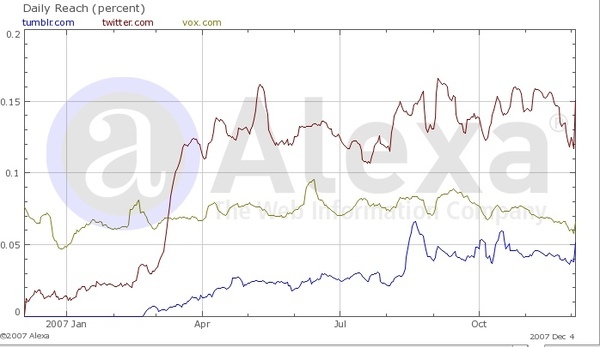 According to Comscore, about 6mm unique visitors worldwide come to Twitter, Vox, and Tumblr combined. That’s nothing near the14mm worldwide uniques who come to wordpress.com or the 8mm worldwide uniques that come to typepad.com. Nor is it anywhere near the 40mm worldwide uniques that come to Facebook or the 70mm worldwide uniques who come to myspace. But my gut tells me that combining the personal expression elements of blogging with the emotional aspects of social networking in a lightweight manner that allows anyone to be a blogger with ease and not much commitment (think iphone walking down the street and seeing something cool), will yield a very large market of people who both consume and contribute content in these social blogging systems. That’s the bet and we’ve made it twice now. And I am feeling pretty good about it.